Eiro Research Went Belly Up. What's The Lesson? You are here: Home / Network Marketing Training / Eiro Research Went Belly Up. What’s The Lesson? Eiro Research Went Belly Up. What’s The Lesson? 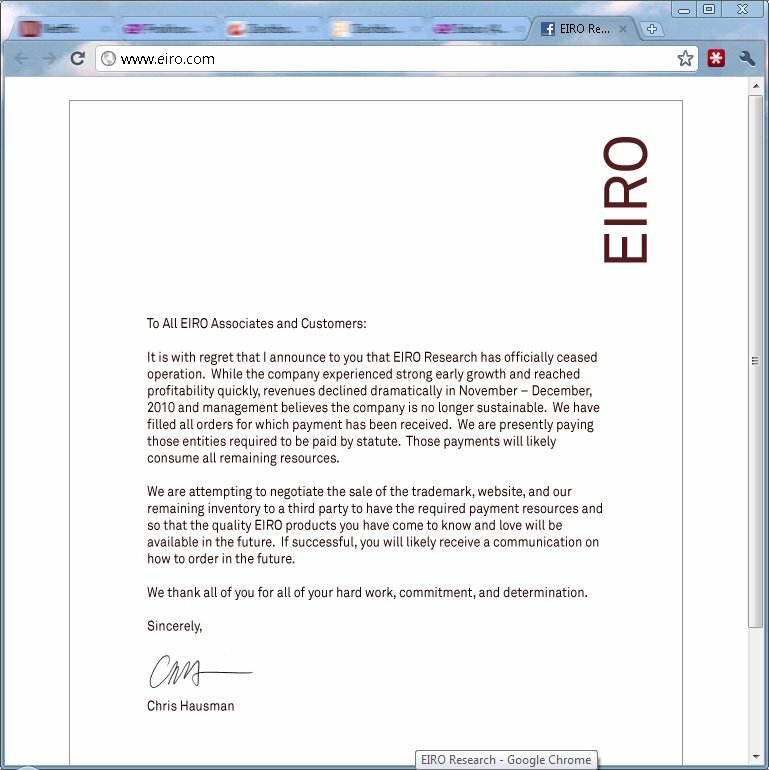 Since the publication of this blog post, Eiro Research has removed the letter and REVIVED the company as a NON-MLM business! While so of the former Eiro Research distributors eventually found a new home… some were completely devastated by this breach of trust in business. This is just another reminder that if you are an entrepreneur in the network marketing industry, it’s important to know that “the business” is just a part of your overall business and shouldn’t be your ENTIRE business. as of yesterday, Wednesday, January 19th, 2011. While it was an unfortunate situation, it wasn’t an isolated incident… and I wasn’t surprised. I read the letter attached below, what I saw was the company looking after the company first, their distributors SECOND… that they must pay back the creditors as the No. 1 priority, which would consume all remaining resources of the company. In 2010, we saw SEVERAL companies that had similar situations happen to them. Again, these situations are utterly unfortunate. The emotional roller-coaster ride these Eiro Research distributors must have experienced is something I’d wish upon NO ONE. moving from one company to another… and I lost my entire downline that was earning me a full-time income in my first and only network marketing company up until that point in my career in this industry. The reason for it was the company making major changes to its P&P and compensation plan, which caused a tidal wave of distributors (by my estimation, over 30,000) leaving the company together. At first I was totally confused. And then I was in DENIAL. And I even thought about “sticking it out” and getting back to the old business because I had been singing the company song and doing the company dance for almost 5 YEARS. But when my diminishing checks eventually dried up, and 5 years of hard work simply evaporated… it was a RUDE awakening, to say the least. Fortunately for me I had saved every penny I earned from that business up until that point, and I made a clear and conscious decision to get out into the industry, make new friends… 6, 7 or even 8 figure field leaders such as Mike Dillard, Ann Sieg, Jackie Ulmer, Diane Hochman, who have all come before me in this industry and learn from them. I’ve finally come to realize that the company TOP concern is its own survival, not the distributors as many company executives like to tell us. Realizing this fact actually gave me a stronger than ever resolve to remain in the industry to help more people build their businesses, but with a distinctively different perspective. There has long been a baby-sitting culture which partially came as a by-product of wanting to making everything 3rd grade duplicate-able in the industry. Making money is not “hard,” but it certainly requires some skills, technical or otherwise. Home business entrepreneurs/Network Marketers/Multi-level Marketers/Direct Sales affiliates MUST realize that their financial well-being is in their own hands and no one else’s. This is about doing everything in your power to get it done! That’s the reason why I invested the past 3 YEARS researching companies, visiting companies, sitting down with top leaders and company owners, investing in training, experimenting and testing to create Real Work At Home Profits to teach our friends in the industry how to become stronger by learning and applying skills that they can take with them anywhere and make money, regardless what the company decides to work with. Feel free to chime in in the comments section below regarding Eiro Research or this type of situation in general. I look forward to hearing from you and turning this into a massively positive and productive discussion for all to see and learn from. Remember, you’re doing this FOR YOURSELF, but NOT BY YOURSELF. By the way, the above image has been removed from the Eiro Research official website. another one strikes the dust…! companies come and go, relationships stay with u no matter what happens..
That is incredibly shocking. I can’t believe that happened. I never saw Eiro Research bellying up like that. I can only imagine what they are going through over there, it felt like such a strong company. Especially since they had just released a new product and everything! I know how that feels, I was part of iLearningGlobal as you know Jerry. That experience truly is a horrific one to feel, it puts you at a loss for what to do. Really tests the resolve. I hope those people keep on going in our profession, make their initial dreams they had when they got start not fall by the wayside and just keep pushing on through. Yup, relationships are the essential currency (of pretty much every industry). Human social interactions are what make the world turn. Hey Greg – Network Marketing is indeed a profession, and more people need to recognize that! Great to know that you’re going strong in the industry despite ILG’s disappointing decision (from the distributor’s perspective anyway). With every business there is risk, it’s knowing what the risk is and how to avoid it. thanks for your clear words. I also read this letter and shook my head because of the very issue you mentioned. In most cases, MLM companies fail by design. The design is all laid out in the policies and procedures – they’re telling everybody what thy intend to do, for example going into retail once the customer base is larger enough, terminate people anytime for any reason etc. When we read such clauses we need to ask ourselves: Why do they included such clauses ? The only answer is: Because they plan to use them. Otherwise they wouldn’t include them. It’s just that simple.